The Bracco Italiano was developed in Italy as a pointing dog. Originally used to find and point game that was captured by nets, it has evolved over the years into a fine upland shooting dog. The Bracco Italiano was recognized by the United Kennel Club in 2006. A powerful, symmetrical dog with clean lines and strong muscles, the Bracco Italiano has a distinctly sculpted head that gives uniqueness to the breed. Tough enough for all kinds of hunting, yet docile, intelligent and very easily trainable. Long, angular and narrow. Skull and muzzle are of equal length, and the toplines of the skull and muzzle are distinctly divergent. Arched in profile, oval when viewed from above. Width at the widest point should not exceed half the total length of the head. Occiput is prominent. Stop is slight; with a groove between the eyes that ends mid-way to the back of the skull. Forehead is pronounced. Cheeks are lean. Nearly as deep as it is long, with a straight or slightly convex nasal bone. Tapers in width slightly from stop to tip. Chin not prominent. Upper lips thin and loose without being flaccid. From the front, they form an inverted V beneath the nose. The Bracco Italiano has a complete set of strong, white teeth that meet in a scissors or level bite. Disqualifications: Overshot bite. Extremely undershot bite. Obliquely set, fairly large, oval in shape, with tight fitting lids. Expression is soft and submissive. Dark ochre or brown in color, depending on coat color. Large and fleshy, with well-opened nostrils, the nose protrudes beyond the line of the lips. Brown, pink or flesh colored depending on coat color. Long and set low, and well back, without much erectile power. Rather narrow at the base, the front rim is well turned inwards, and the ears are carried close to the head. Slightly rounded at the tip. Long (not less than 2/3 of the length of the head), and arched with a soft double dewlap. Shoulder blades long, strong and sloping, with very free movement, with a corresponding long, well angled upper arm that sets the elbows back under the tops of the shoulder blades. The tops of the shoulder blades are well separated. Long, straight and sinewy, with oval bone. Pasterns of good length and slightly sloping. Square or slightly longer than tall in proportion, measured from breastbone to buttocks and withers to ground. Chest broad and deep, reaching to elbows, but without a prominent keel. Ribs well sprung, and deep to the back of the body. Withers are well defined, and the tops of the shoulder blades are fairly far apart. Topline slopes downward from the withers to the 11th dorsal vertebrae, and then rises to a slight arch over the broad loin. The croup is long and broad, with the pelvis sloping 30 degrees off the horizontal. Long upper thighs that are parallel when viewed from the rear. There is good bend of stifle. Hock joints are wide apart and the rear pastern is short and lean. Oval in shape, with well-arched, tight toes and lean, elastic pads. Nails white, yellow or brown depending on coat color. Rear feet may have single or double dewclaws. Thick, straight, and slightly tapering. Should be docked from six to ten inches in length. 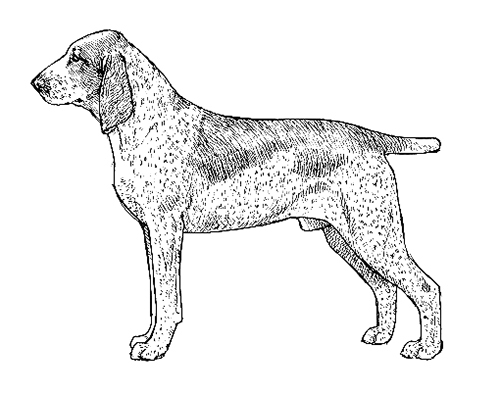 When the dog is in motion, particularly when hunting, the tail is carried nearly up to the horizontal. Coat is short, dense and glossy, finer and shorter on the head, ears, front of legs and feet. Skin is thick but elastic, finer on the head, throat, armpits and lower body. Mucous membranes are a color that corresponds with the coat but must never be black. Disqualification: Mucous membranes or skin that is black or has traces of black. Solid white. White with orange or chestnut patches. Orange or chestnut roan. In the chestnut roan, a warm shade, reminiscent of a monk’s frock, is preferred. A symmetrical face mask is preferred but the absence of one is tolerated. Disqualifications: Black, black and white, tricolor, fawn, hazel, any solid color, any tan markings. Albinism. Preferred size for males is 22¾ to 26¼ inches at the withers; for females, 21¾ to 24½ inches. Weight 55 to 88 pounds, depending on size. An extended and fast trot, with strong drive from the rear quarters. Head carriage is raised, and the nose is held so that it is higher than the topline. The graceful, effortless ‘Bracco trot’ is the breed hallmark, with the dog appearing to float on a cloud. More than one inch over or under the preferred size. Mucous membranes or skin that are black or have traces of black. Black, black and white, tricolor, fawn, hazel, any solid color, any tan markings.